We set out to conduct a thorough and detailed test of the best lightweight sleeping pads on the market, one that includes more products and is more in-depth that any sleeping pad review that Gear Institute has done in the past. 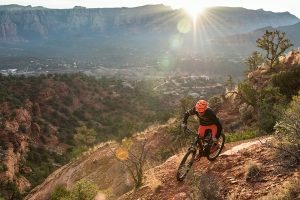 We began by researching the state of the market and asking ourselves some key questions: which pads are commonly seen being used in the backcountry? Which are popular with online reviewers? 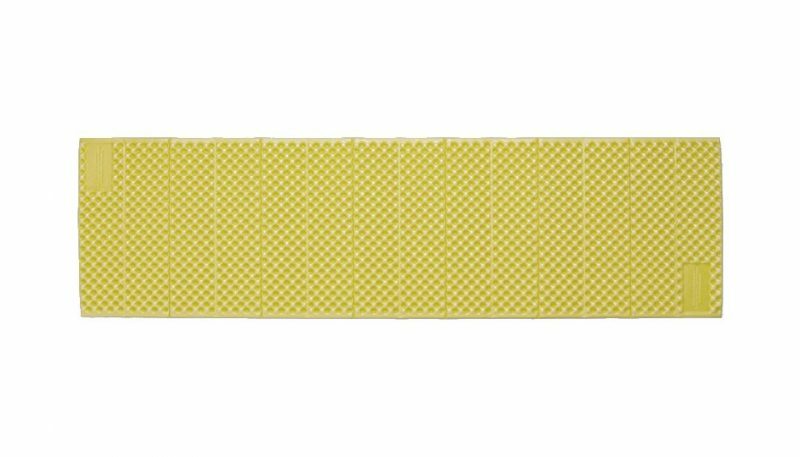 Which sleeping mats do our testers personally love and rave about? What are the newest and most innovative products available? Then we compiled a list of 10-12 pads that we wanted to investigate more closely. After detailed research we whittled our list down to seven top-of-the-line products that we wanted to subject to real world use. We put seven top-of-the-line lightweight sleeping pads to the test over multiple months of testing. Then we assembled a team of 10 different testers. 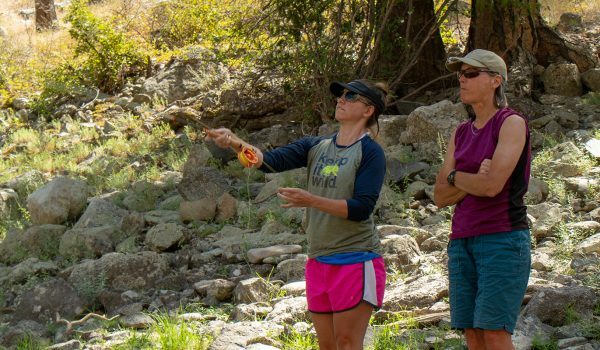 This team includes a mix of ages, genders, physical ability, and outdoor experience. This allowed us to compile feedback from people with different concerns and perspectives so that we could really hone in on what is most important across the board. These pads went on overnight climbing adventures, mutli-day treks in the mountains, and were used multiple nights car camping, just to make sure we got enough mileage on each one. We even used several of these pads for sleeping on the floors of friends’ houses. This is the most comprehensive sleeping pad test that Gear Institute has conducted. 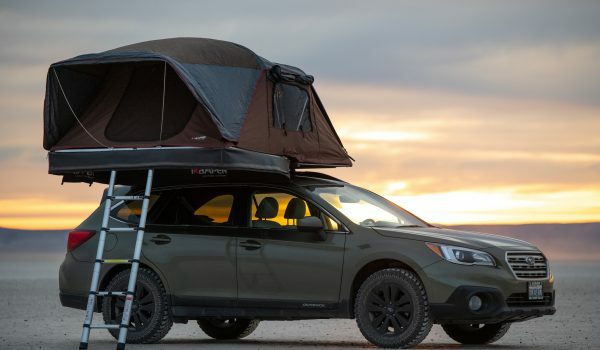 It includes examples of all three of the lightweight sleeping pad styles: closed-cell foam mats, self-inflating sleeping pads, and air construction inflatable mats. All of the models that we examined aim to be as light as possible for carrying with you for an overnight in the outdoors. 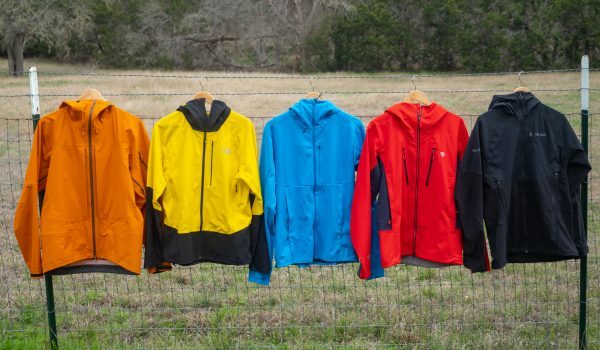 The products we put to the test are the best-of-the-best in this lightweight category. The first step to evaluating sleeping pads is to put them to use in the scenario they were designed for: camping. 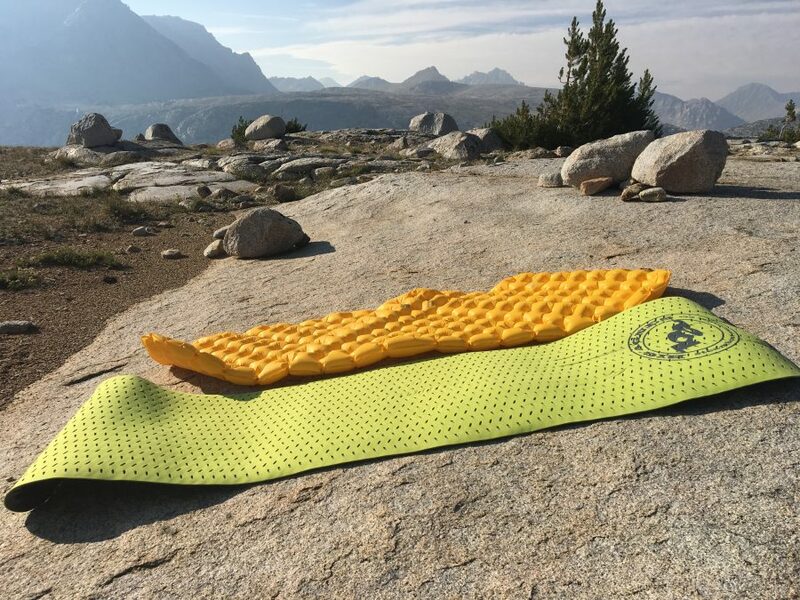 From Utah to Wyoming to Alaska to California our team of testers brought these sleeping mats along on every kind of outdoor adventure that they dreamed up. We inflated and deflated each pad, rolled them up and stuffed them into backpacks, and carried them for miles on our backs. 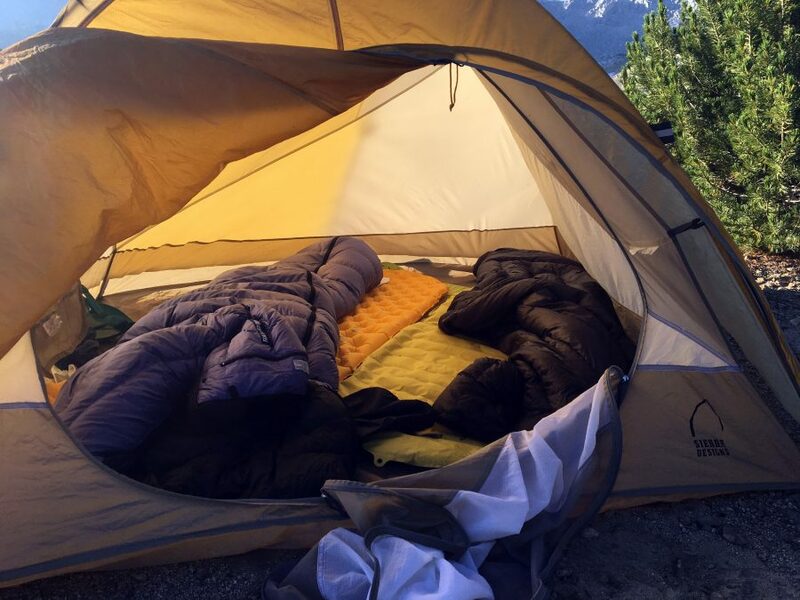 We slept many nights on them: from hot and humid summer evenings to cold clear nights at high altitudes to temperate nights in campgrounds. 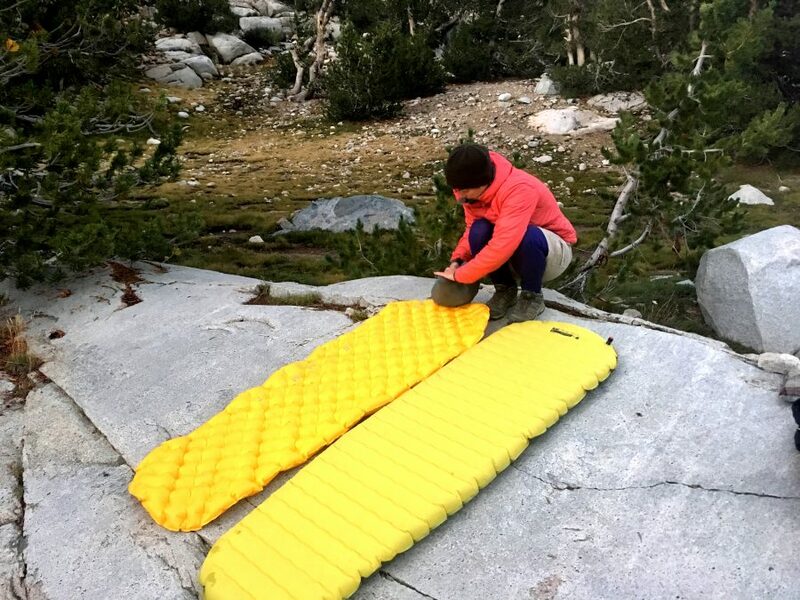 Overall, we found that low weight and small packed size were the most important metrics for evaluating these sleeping pads. The small and light models were the easiest to bring along on overnights, and became the most frequently used mats. Pads in the lightweight category are getting progressively lighter and smaller while retaining comfort and durability. 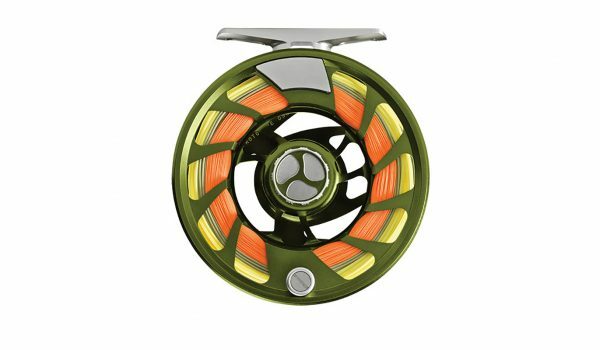 Next season even lighter weight options will be making a debut. The next consideration after weight and size was warmth. It seems fairly standard for a company to produce a small and lightweight inflatable pad, but it is much more unique to produce a small and light pad that is also warm. This is where the big differences in products began to appear. Ultimately, our decision to award the Therm-a-Rest NeoAir XLite with our prestigious Best in Class award is because that pad hits all of the important metrics with flying colors: it packs small, is lightweight, comfortable, and is warm. It has the highest R-value of any pad in this test and was noticeably warmer than the other sleeping mats we evaluated. Durability, while important, was a less discerning metric in this test because all the pads performed well across the board. The closed-cell foam mats are certainly more durable than the inflatable mats— which are vulnerable to punctures—but over the course of months of testing and hard use we never had any failures with the inflatable mats. Read on to learn about the nuances and differences among the products in each scoring metric. Since this is the lightweight sleeping pad test, weight is of utmost importance. This is the easiest category to observe because it is completely objective. First we recorded the manufacturer listed weight for each product, then we weighed each on our own scale to verify the weights. The overall lightest mat in this test was the Therm-a-Rest ZLite at 10.4 ounces, but this is a slight anomaly because we tested a size small in this model, where every other model we tried was a regular length. 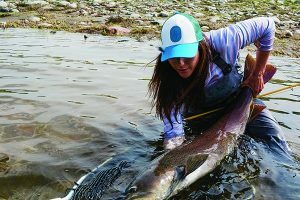 A size Regular ZLite is listed at 14 ounces, and since in our weight verifications Therm-a-rest proved to be accurate, we decided to score the ZLite based on a 14 ounce weight, to make everything even. 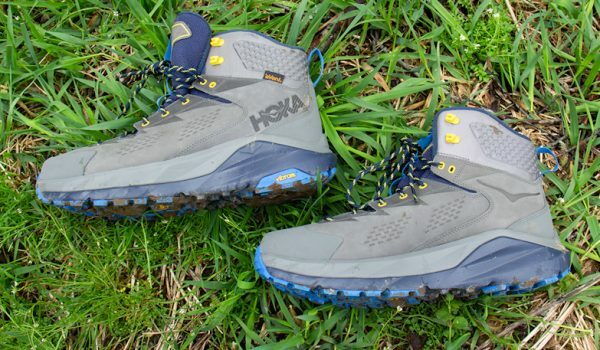 With this adjustment factored in, the lightest pad is the Therm-a-Rest NeoAir XLite, which weighed 11.8 ounces. A few others came close: the Sea to Summit Ultralight Mat is 12.6 and the Big Agnes Third Degree is 12.5 ounces. 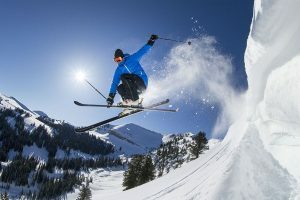 Ultimately, the low weight of the NeoAir XLite coupled with its warmth, is what pushed it to our favorite of the bunch. We often brought multiple pads along with us into the backcountry to get a sense of what makes each pad different. Our testers developed a preference for the smallest and lightest sleeping pads. After weight, packed size is the second most important consideration for a lightweight sleeping pad. 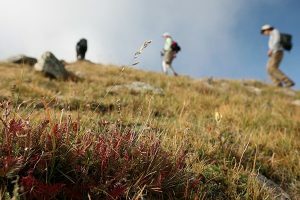 If it is to be carried in a backpack, sometimes for days at a time, then it helps if it is small and easy to pack along. The two closed-cell foam mats are the bulkiest, and they received our lowest scores here. These are awkward to carry because they need to be strapped to the outside of a backpack and can make tight squeezes and even resting your backpack on the ground difficult. The next largest is the Therm-a-Rest ProLite, which is a self-inflating pad. The other four pads all have similar small and sleek packed sizes, perfect for tucking into a corner of a backpack. Our line-up of tested lightweight sleeping pads, rolled and stored in their stuff sacks to show packed size relative to one another. 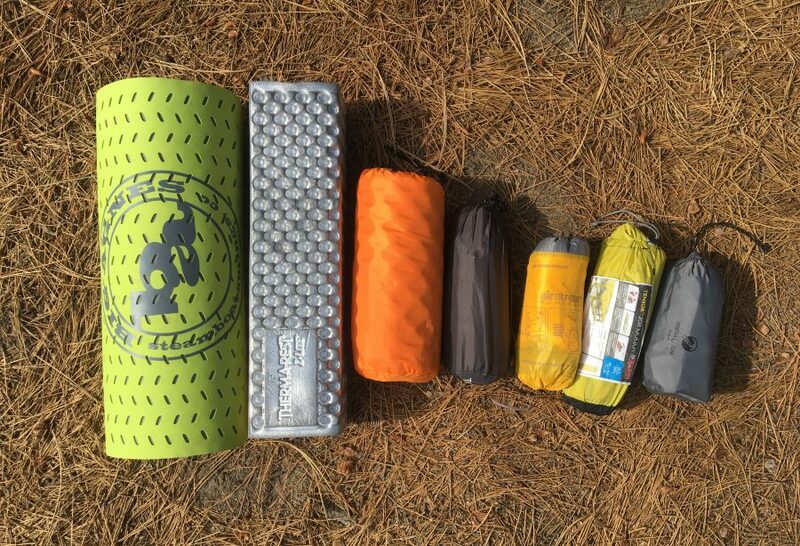 From left to right: Big Agnes Third Degree, Therm-a-Rest ZLite, Therm-a-Rest ProLite, Therm-a-Rest NeoAir XLite, Sea to Summit Ultralight Mat, Nemo Tensor, Klymit Inertia Ozone. Comfort is an important feature for a sleeping mat. No one wants to roll over during the night and have their hips dig into the ground. We found that our testers had a few different opinions on what makes a comfortable sleeping pad. Three mats earned the same comfort score, but each one has a slightly different feel that might appeal to different people. 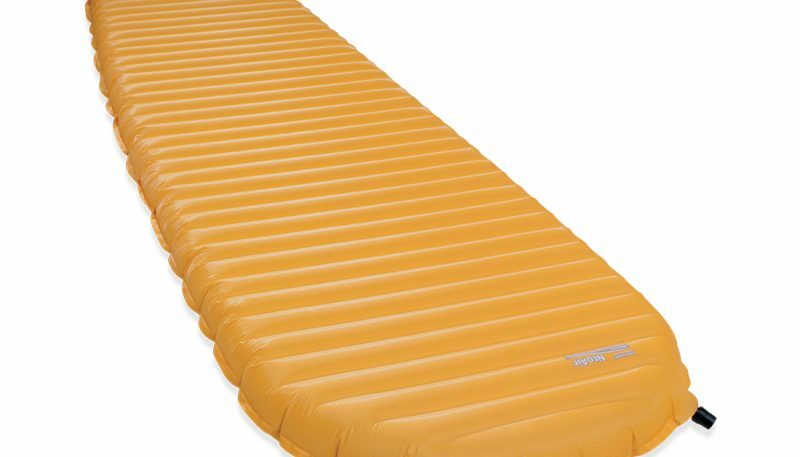 First, the Therm-a-Rest NeoAir XLite, which when inflated is 2.5 inches thick, scored an 8 out of 10 for comfort. This pad provides plenty of padding, but can feel a little like sleeping on a balloon. It can be customized to feel firmer or squishier depending on personal preference. 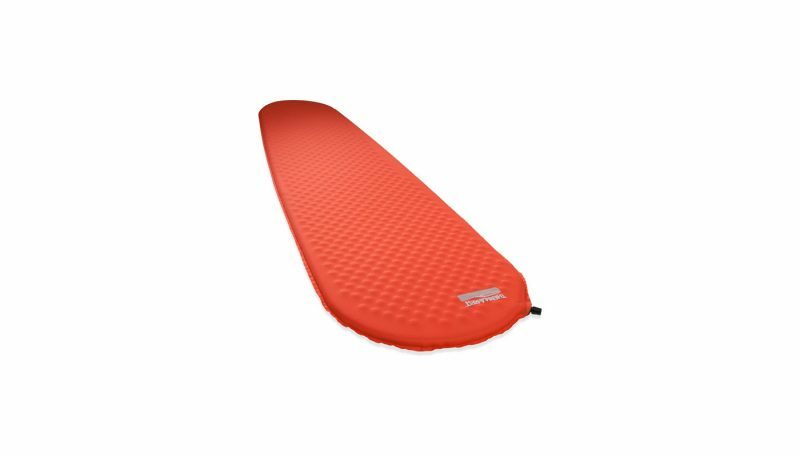 Next, the Sea to Summit Ultralight Mat also scored an 8. 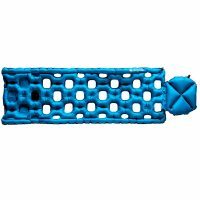 This pad has a unique design with 181 air cells interspersed with flat sections in between. At first glance the pad looks as if it will not be comfortable, but the air cells mimic the feel of an actual mattress with springs, so overall it has a less-raft-like, more bed-like feel. Third, the Therm-a-Rest ProLite also scored an 8. 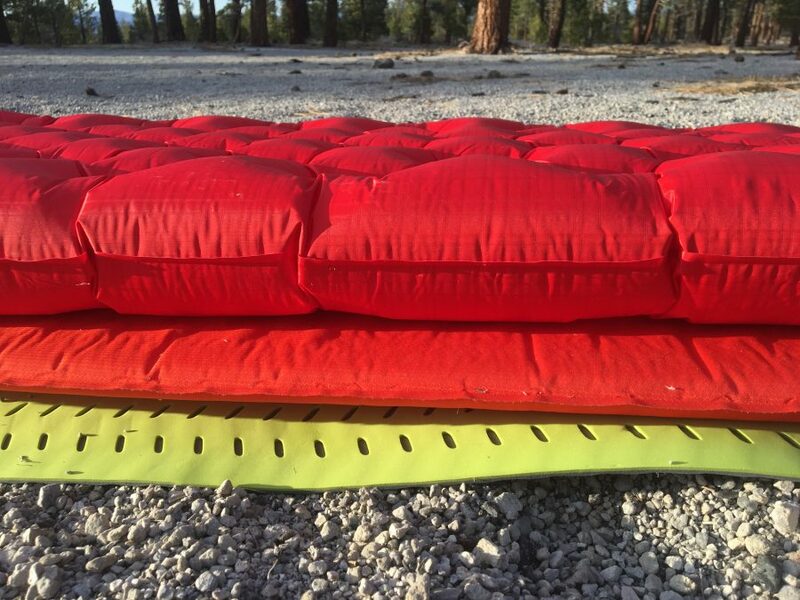 This was the only self-inflating sleeping pad in this test, and it combines foam and inflation technology. This gives it a firm, spongy feel that most testers enjoyed. However it is thinner than most other sleeping pads in this test, at 1 inch rather than 2 or more inches thick. Right behind these three pad came the Nemo Tensor, which is the thickest and plushest of them all at three inches thick when fully inflated. Some people love this cushion, others reported feeling like they were going to roll off of it all night long. The pads that scored the lowest were the closed-cell foam mats, which are thin and offer less cushion than inflatable pads, and the Klymit Inertia Ozone, which has holes in the body of the pad that cut weight but leave no padding on the hips for side-sleepers. Comfort was assessed by sleeping on each pad for multiple nights. We solicited opinions from at least 10 different testers. To evaluate which sleeping pad is the warmest, we started by comparing R-value. R-value is a measurement of the ability of an insulation to resist heat flow, with a higher number indicating better insulating properties. 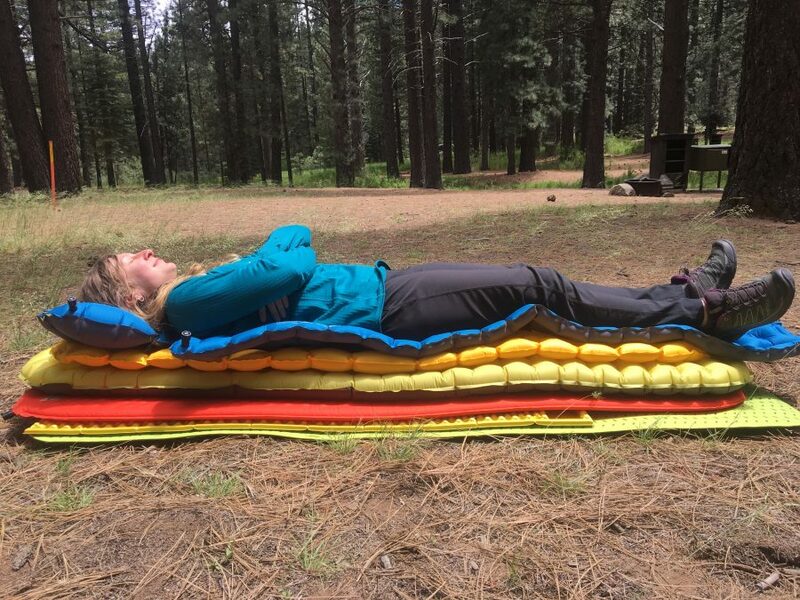 This is the standard measurement for sleeping pads because a pad aims to prevent a person’s body heat from flowing into the cold ground, and the coolness of the ground from reaching the sleeping body. 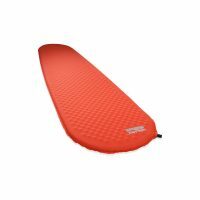 The main thing a consumer should keep in mind when shopping for sleeping pads is that models with higher R-values will be warmer. When we first compared these ratings, we realized that half of our test products do not have an R-value. 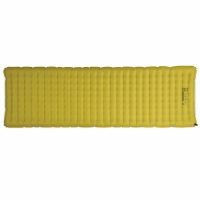 Nemo and Big Agnes do not give their sleeping pads R-values. The reasoning behind this is that those companies do not believe that the testing is standardized enough to be meaningful, and they do not think that the average consumer can accurately translate an R-value into a temperature range where the pad will be useful. 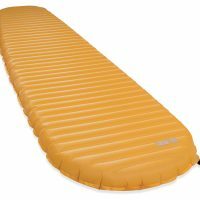 There is some validity to this argument, but the lack of this rating makes it much more difficult for a customer to objectively compare sleeping pads. The other pad that does not have an R-value is the Klymit Inertia Ozone because it has holes incorporated in the design, making it impossible to assign a rating to the pad. 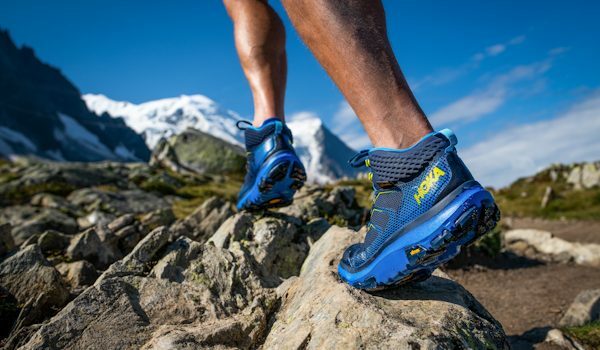 The model with the highest R-value is the Therm-a-Rest NeoAir XLite, with a rating of 3.2. The Women’s model of the XLite is even warmer, with an R-value of 3.9. These ratings are far above all the other pads in this test, with the second and third ranked pads also being from Therm-a-Rest: the ZLite at 2.6 and the ProLite at 2.4. 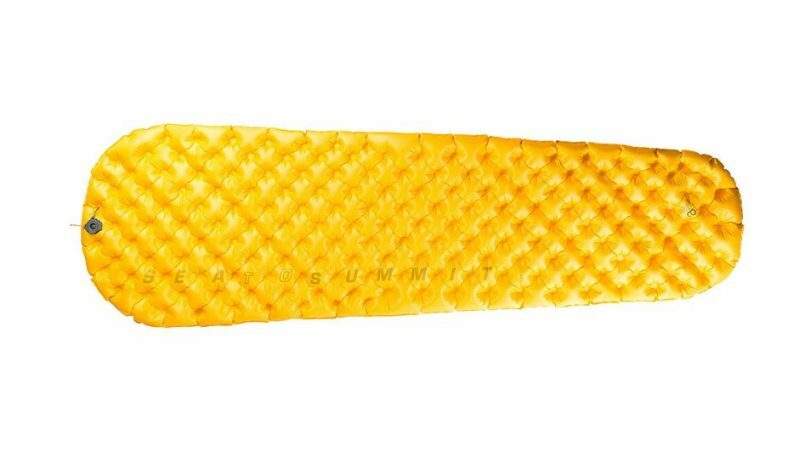 The Sea to Summit Ultralight Mat has an R-value of 0.7, indicating that it is best reserved for warm weather camping. In practice, we confirmed that the NeoAir XLite is much warmer than all the other mats we tested, which is one of the reasons we think it deserves our Best in Class award. We found that the Nemo Tensor, which doesn’t have an R-value but is suggested for use in a 30-40F temperature range, feels much colder than most of the other pads. 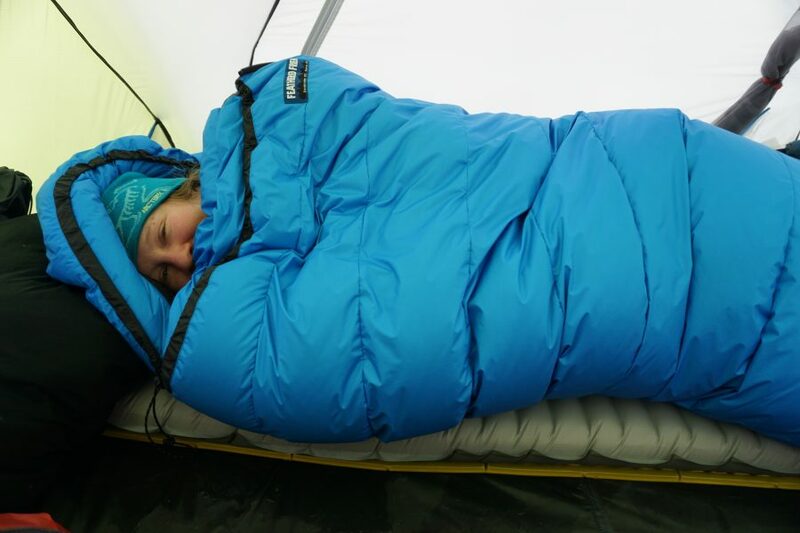 A couple testers reported spending cold nights on the Tensor and another noted that he used it on a very warm night, but he could feel the cool ground through the pad anyway. If warmth is a priority, closed-cell foam sleeping pads can be doubled up with an inflatable pad, as seen here when camping on a glacier in Alaska with both the Therm-a-Rest ZLite and an inflatable version of the Therm-a-Rest NeoAir. In one sense durability was easy to measure. All the inflatable mattresses are vulnerable to puncture while the closed-cell foam mats cannot be popped or ruined. Even a tear in the foam pads wouldn’t compromise their function. So these mats earn a deserved 10 out of 10 for durability because they are practically indestructible and could last a lifetime. But how to compare the durability of the different inflatable sleeping pads? 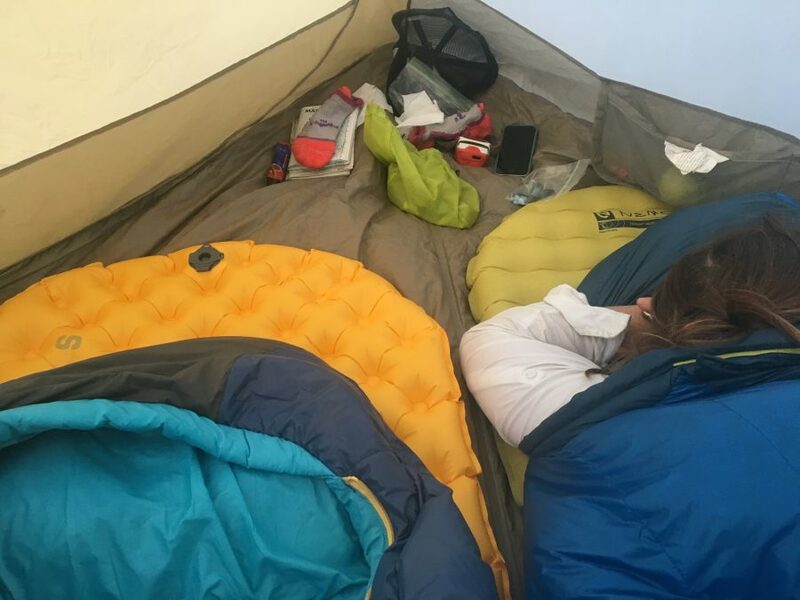 We did not have any pops, punctures, or failures on any of the products we tested, so absent a memorable error we had to find another way to compare the sleeping pads. We decided to look at the face materials of each mattress and compare the denier of the threads used in the materials. Denier measures the linear density of fibers, with a higher number indicating more dense fibers over a given length. Denier can give some indication of durability, but other attributes such as thread count and weave patterns also come into play. 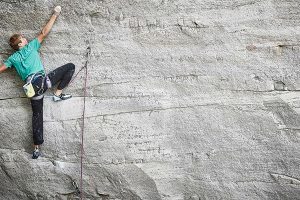 Typically a higher denier also means more weight, so lightweight products will often use lower denier fabrics and sacrifice some durability for weight. In our case, we are using denier to help us estimate the durability of each product. 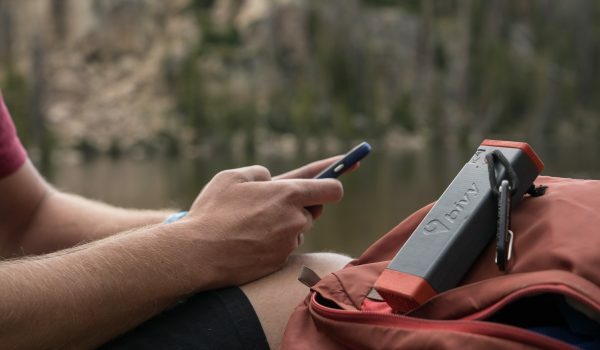 The Klymit Inertia Ozone stands out here, because the bottom of the pad is constructed from tough 75D material, while the top is lighter weight 30D. Next comes the Therm-a-Rest ProLite with 50D material on top and bottom. The foam inside this self-inflating mat increases its burliness even further. The Sea to Summit Ultralight Mat used 40D material, the NeoAir XLite uses 30D, and the lightest of them all is the Nemo Tensor with 20D material. Inflatable mats are always going to be vulnerable to puncture. If durability is a priority, closed-cell foam mats are the way to go, because they are virtually indestructible. When evaluating ease of use we took note of two primary things: set-up and stowing. Obviously, the closed-cell foam mats score high for ease of use because they require no set-up at all: they unfold or unroll and then roll or fold back up. This takes two seconds tops. The next notable easy to use sleeping pad is the ProLite. It self-inflates, so all that is required is to remove the pad from its stuff sack and open the valve. Then it inflates on its own. It does require a lot of squishing and stuffing to get it back into its stuff sack, but the easy set-up is remarkable. All of the air construction mats involve a lot of huffing and puffing to get them in a usable condition, which is the trade-off of such small and compact packed sizes. The one exception is the Sea to Summit Ultralight Mat which has a slick multi-function nozzle that mates with a nozzle on the stuff sack. The sack can then be rolled down to inflate the pad, which takes only a few rolls and almost no time at all. When it comes to deflation, the nozzle opens wide and lets almost all the air out in one go. This was by far our favorite pad to inflate and deflate. The multi-function valve on the Sea to Summit Ultralight Mat coupled with its stuff sack inflation system makes it the easiest to use of all the inflatable mats. It takes significantly less time to inflate than the thick Nemo Tensor. The most important part of testing sleeping pads is to use them in their intended application: for sleeping on the ground. 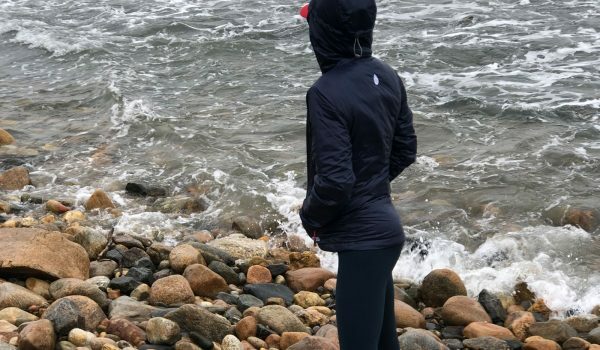 We were able to assess ease of use, durability, comfort, and warmth mostly through using each product and polling testers for their feedback. 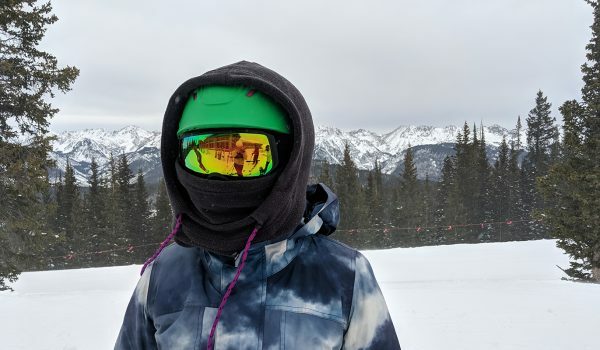 We had a group of ten different people of varying genders, ages, and ability levels use these pads in different weather, on different terrain, and on different style trips. 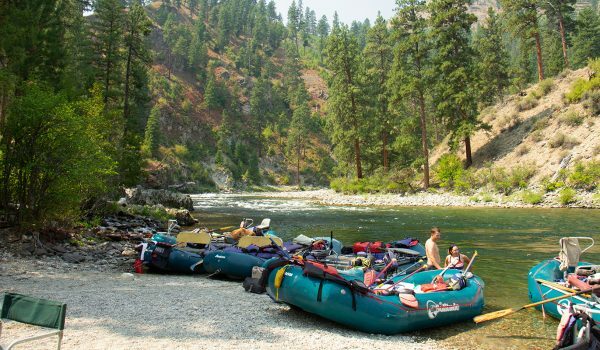 Some were taken on ultralight backpacking adventures, some were used on big climbing objectives, and all pads were brought along on casual nights at campgrounds. Each tester had a unique perspective on what makes the best sleeping pad. 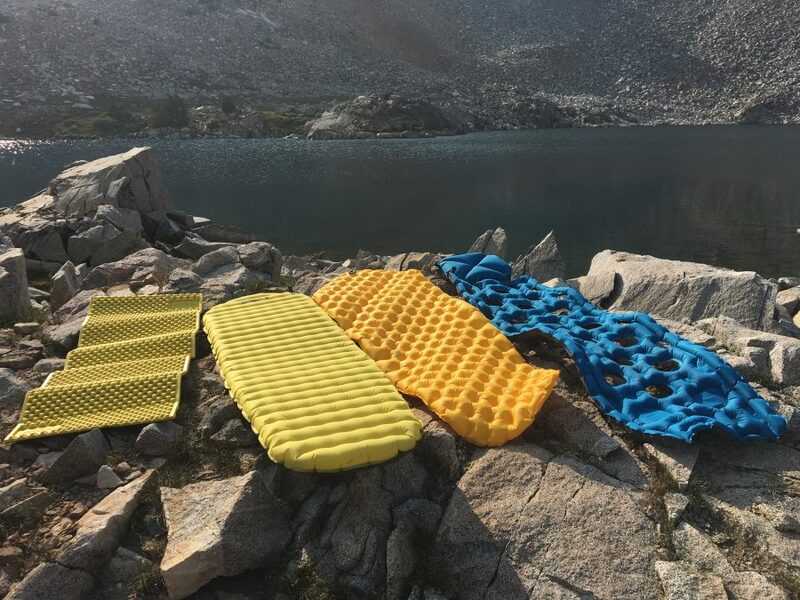 Comparing sleeping pads on a backpacking trip in the High Sierra. We dug a little deeper on warmth by researching and comparing R-value ratings. Additionally, we fleshed out our durability evaluation through a comparison of the the denier of the materials used on each pad’s exterior. Packed size and weight were evaluated a little more objectively. We packed each pad into its included stuff sack and lined them up to compare which was the smallest. For weight, we recorded manufacturer weights, and then verified each weight on our own scale. 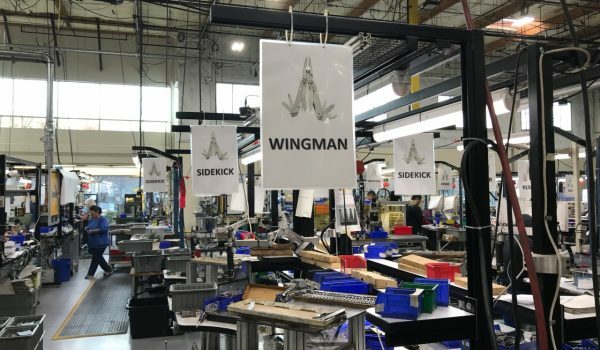 Overall, the heart of our review was composed from the feedback of ten different users who gave detailed reports about their experience with each pad over the course of an entire summer of testing. This feedback painted a clear picture of what it is like to live day in and day out with each of these sleeping pads. 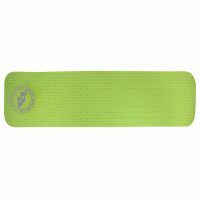 What is a Lightweight Sleeping Pad? 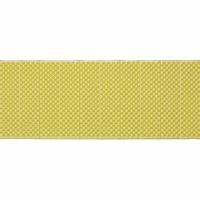 A lightweight sleeping pad is an insulating surface between a sleeper and the ground, and it is kept as lightweight as possible to make for easy carrying in a backpack. It is essential to have a sleeping pad when spending a night outside because it keeps the person warm and prevents them from getting hypothermia. It is also a lot more comfortable to sleep on a pad than to sleep directly on the ground. In recent years the trend with all backpacking gear is to make things smaller and lighter, and sleeping pads are no different. 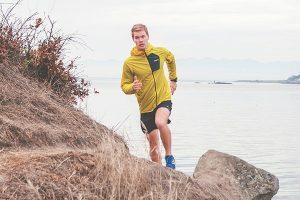 The models we tested in this category all have innovative and interesting technologies to keep them lightweight while still being warm and comfortable. 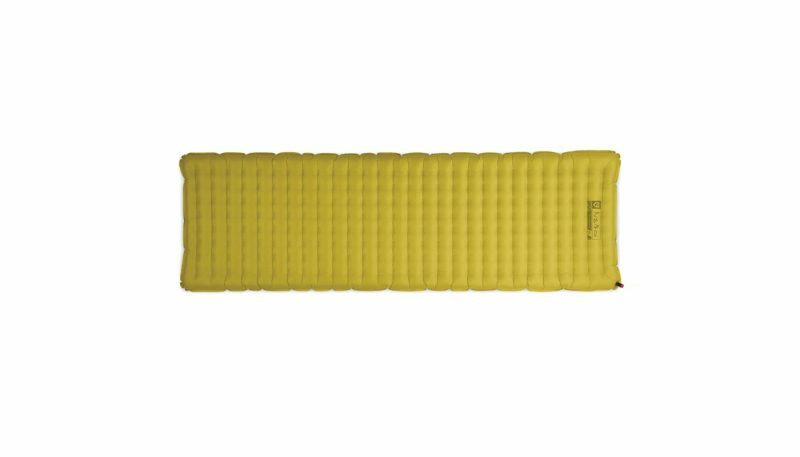 The three styles of lightweight sleeping pads, which vary in thickness: top—air construction, middle—self-inflating, bottom—closed-cell foam. These mats are made from pieces of foam, sometimes with a couple different pieces of varying densities welded together. Closed-cell foam mats do not inflate, but just roll or fold up, and then unfurl onto the ground. This makes them extremely easy to use and extremely durable because nothing can go wrong when using one of these. They also have the benefit of being inexpensive and they are the best for people counting pennies. The downside to closed-cell foam mats is that they are large and bulky, so somewhat awkward to carry on a backpack. They are also thinner and provide less cushion than inflatable mats. Air construction mats are the kind that necessitate being blown up. This is somewhat of a hassle, but the reward is a plush and comfortable mattress to sleep on. Then they roll up very small when de-inflated and they fit easily within a backpack. The huge benefit to inflatable pads is that they can be extremely packable as well as lightweight, so are attractive for carrying when weight matters (and it usually does.) The downside is that these mats are more fragile than foam mats since there is always the potential that one could pop, and they are also expensive. Air construction mats are the high-end products of the sleeping pad world. 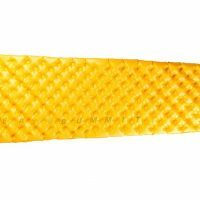 Self-inflating mats bridge the gap between closed-cell foam pads and air construction pads: they are inflatable mats with foam inside. The best analogy is this: an inflatable mat is like a balloon that is small and limp until it is blown up. A self-inflating pad is like a squashed sponge. When it is released from confinement (the valve is opened) then the material springs up and fills with air, holding a predetermined structure. To use one is super simple, just unroll the pad and open the valve. Then it can be left alone for a while it fills up. If needed it can be inflated all at once or topped off with a few breaths, but it mostly works on its own. 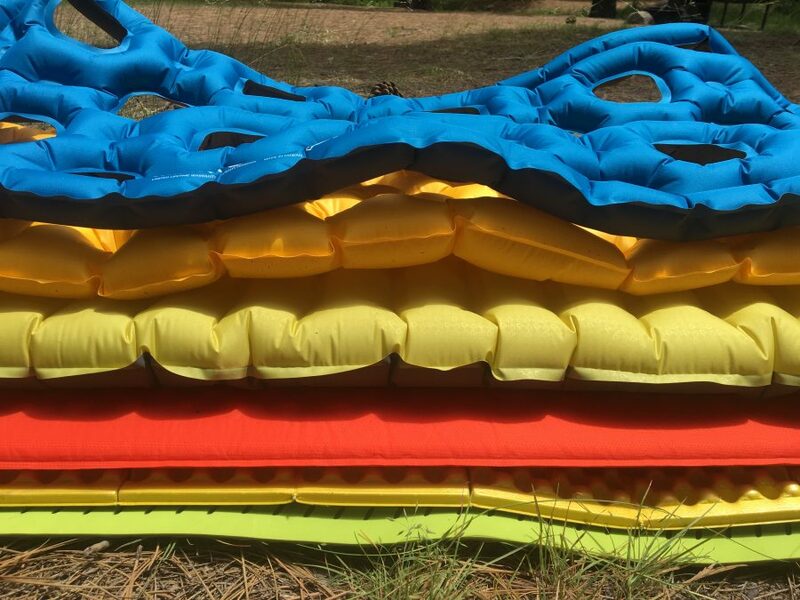 Self-inflating mats straddle the scoring criteria in all directions: they are more durable than inflatable pads, but less so than foam mats. Easier to use than inflatables, less so than foam. Bulkier than inflatables but smaller than foam. Most often they are heavier than both other styles.